This gas station sign is rectangle. The background is blue and yellow stripes. 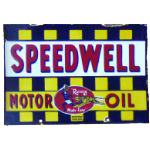 “Speedwell” appears in large red letters at the top of the sign, backed by a banner of white. 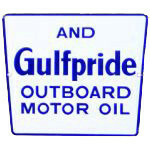 “Motor Oil” appears at the bottom, backed by a banner of yellow.